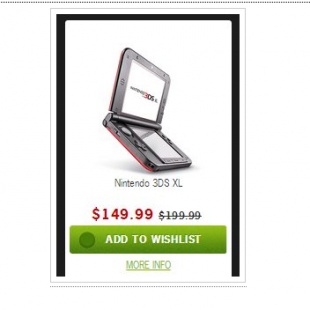 If you've been looking for an excuse to buy a 3DS XL, Target may have your ticket during its 2013's Black Friday sale. I picked up a 3DS at launch and there was always something I didn't like about it. I often just felt like the thing was too light and fragile. I all but held my breath every time I carried it up and down the stairs, certain that one day I would slip and drop it to a step-bouncing doom that a heftier handheld might have survived. Enter the 3DS XL, which basically fixed everything I disliked about the original. It was bigger, weightier and didn't feel quite so much like my one year old could snap it in two if I left it out where she could find it. While it sacrificed some portability, it arguably improved in every other department and I fell in love with it immediately.Now, with Black Friday approaching, Target is preparing to give gamers a considerable discount on 3DS XL's, dropping the price from the standard $199.99 to a considerably cheaper $149.99. The retail chain will also be offering a discounted PS3 bundle that will sell a 250GB PS3 with Batman: Arkham Origins and The Last of Us for $199.99. While that, of course, is a good deal, the 3DS XL discount just seems more interesting somehow. Let's just chock it up the PS3 seeming a bit less shiny now that the PS4 is mere days away from its launch. That aside, if you've been looking for something to help you pull the trigger on the purchase of a 3DS XL, this deal could be just what you've been looking for.